This recording was originally released on what Decca called a 'Medium Play' record (MP) - a ten-inch microgroove record, as opposed to the twelve-inch 'Long Player' (LP). With 78s still in production, and regarded now as 'Standard Play' (SP) these distinctions would have been common parlance at the time. Slowly both the SP and MP discs died out and the LP reigned supreme. The MP did however have a role to play - a less expensive cousin of the LP, it was ideal for shorter couplings such as presented here. These two pieces by Saint-Saëns are both just under nine minutes long and each occupied perfectly a single 10" side. A concert movement written in 1870 for the Spanish virtuoso and composer, Sarasate, this display piece has perhaps something of a flavour of Spain in it. The story behind this piece is documented thus: During a concert tour in France in 1885 undertaken with the violinist Raphael Diaz Albertini, an overnight stay in the depths of winter in Brest resulted in the composer, with some difficulty, having to collect his own firewood and light it to heat the room they shared. 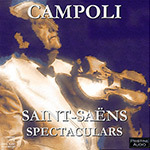 Whilst watching the flames, Saint-Saëns noticed that a piece of wood was 'whistling' with the vague elements of a tune. This he recalled and used as the principal theme of this piece two years later, which he dedicated to Albertini in memory of their adventures.